Hello, hello! I have a cool new, independent, Canadian (!!!) brand to introduce you folks to today. 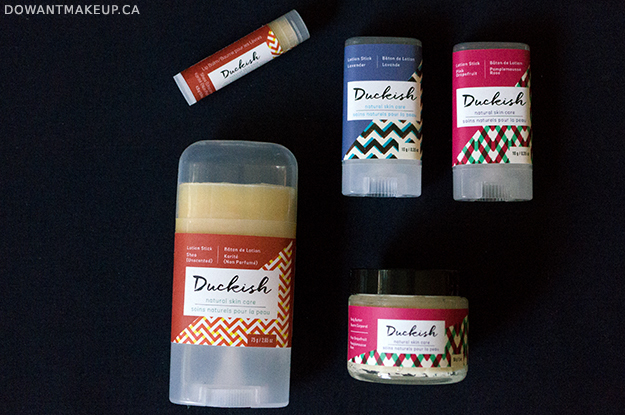 Duckish is handmade in Canada and proud of it--products are made in Halifax, Nova Scotia, and the word "duckish" is a Newfoundlander term for dusk, the perfect time for a little self care with some seriously hydrating body products. 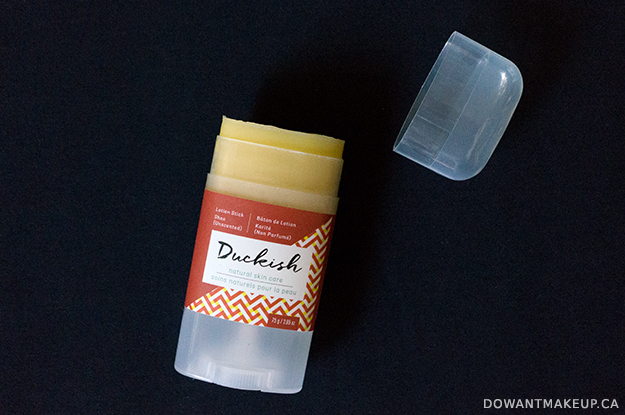 Duckish's first product was the Diaper Rash Stick, a convenient, mess-free alternative to those thick diaper rash creams. Since then, they've branched out into bath salts, lip balms, and lotion sticks. Like these! The Lotion Stick is available in the large 2.65 oz size. 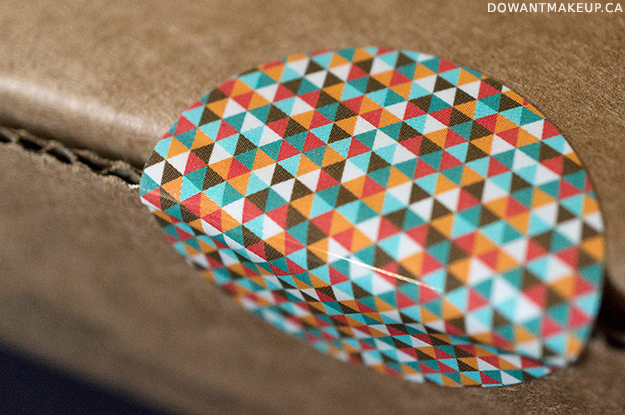 The mini size is ridiculously adorable at 0.35 oz, and fits perfectly in a purse or desk drawer. The colourful label indicates the essential oil added to the product: orange for unscented (shea/no essential oil added), blurple for lavender, and magenta for pink grapefruit. There are also mint and tea tree oil varieties. Let's start with the basics: the Lotion Stick. It's packed with hydrating oils such as grapeseed, coconut, and olive oil, plus beeswax and shea butter. It really is practically unscented (if I try hard enough, I can maybe pick up a very mild scent of shea butter, as unrefined shea butter has a slight nutty scent). The size is perfect for gliding over arms and legs, and melts readily upon contact with skin--I don't need to warm it up or press too hard to use it. Though it's touted as a way to moisturize while leaving your hands "lotion-free", I found it was better to use my hands to massage it in a little after applying. It's definitely more convenient and a little less messy than conventional lotions that I have to slather all over with my hands. I love my cute mini Lotion Sticks. 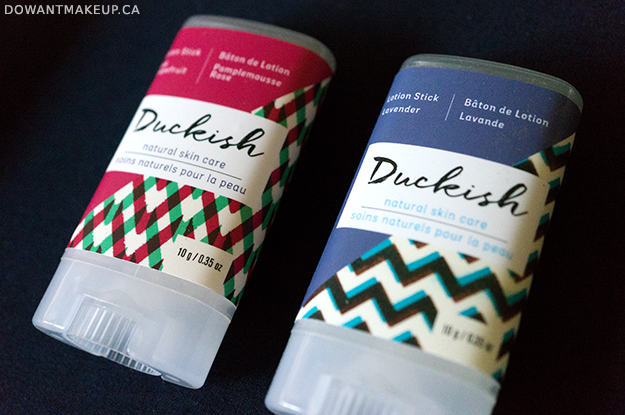 These Lotion Sticks have the same hydrating formula as the Shea version, just with a little essential oil added. The scent of Pink Grapefruit is definitely my favourite: it's bright and cheerful and exactly what I love about citrus scents. Lavender's soothing, relaxing scent is a good option for use before bed. The small size works perfectly for throwing into my bag. I've been applying it to my cuticles, rubbing the surface with my fingertip to apply to lips, and in a pinch, applying a little bit to my hands and rubbing them together as a hand lotion. Lately my eczema on my hands has been flaring up, and I've been applying this to my angry red patches with some success. Next up is the Body Butter, which I received in Pink Grapefruit. Due the the higher shea butter content (it's the first ingredient! ), the nutty shea butter scent is stronger while the pink grapefruit scent is more in the background. 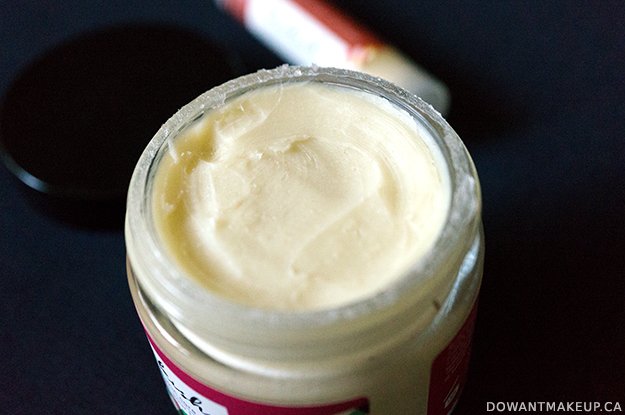 Compared to the Lotion Stick, the Body Butter is creamier and has less "slip". At room temperature, I can still run my finger across the surface of the butter and pick up some product to apply to my lips, cuticles, or anywhere else than needs a boost. Between this and the Lotion Stick, the ingredients are about the same between the two products (except for the beeswax in Lotion Sticks); the order of ingredients just differs a little. 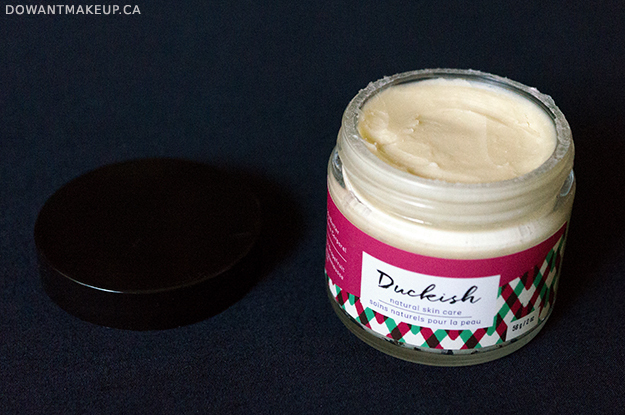 The higher shea butter content in the Body Butter suggests that it packs more of a moisturizing punch, though the Lotion Stick is a bit more convenient to use. 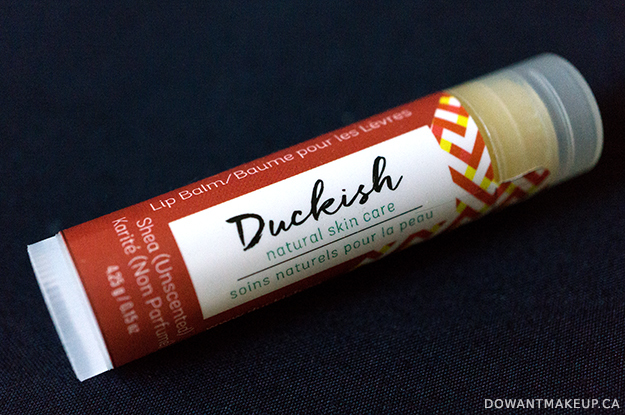 Duckish Lip Balm has a lot of ingredients in common with its Lotion Stick sister. As you might expect, it's a similarly hydrating, softening product in a convenient lip balm package. It has a lot of "slip" and imparts a glossy sheen to the lips because of grapeseed, olive, and coconut oils. If I'm going to be wearing lipstick, I like to let it sink into my lips while I get the rest of my face ready, and then "kiss" off any excess onto my hand before applying lipstick. Overall, I quite like Duckish's simple and straightforward products, and even better, the price point is very reasonable. The use of beeswax, oils, shea butter, and vitamin E gives you products that have both an emollient (softens, moisturizes) and occlusive (locks in moisture) qualities, which is what you want in a hydrating product. 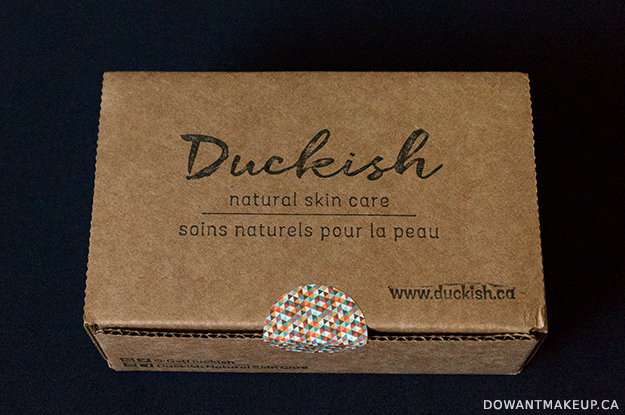 Duckish's creator made many of these products with her own eczema-prone skin in mind, and having eczema myself, I can agree that a lot of these products are suitable for maintaining the skin barrier essential to warding off angry, inflamed skin. Essential oils can sometimes irritate sensitive skin though, so if you are not sure how your skin reacts to them (my skin generally is okay with them), stick to the unscented, shea versions. For me, the mini Lotion Sticks are the star of the show: all-purpose moisturization in a convenient and purse-friendly package, what's not to love?